Are you tired of missing out on that raise, bonus, or promotion? Do you want to turn your dead-end job into a high-paying career? Would a six-figure salary solve all your problems? Money-making guru Alan Corey faced all these questions himself, then went from collecting unemployment checks to a six-figure career in just over a year. This inspirational and entertaining book is jam-packed with easy-to-follow steps that you can use to transform your own career. Alan couples his personal anecdotes with scientific studies that are guaranteed to increase your salary. 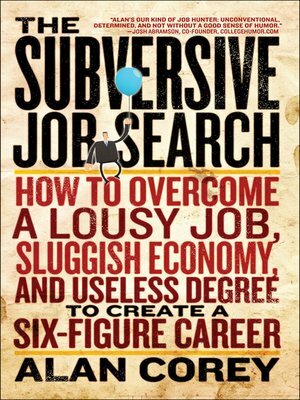 The Subversive Job Search will help steer you into the $100,000-plus career you've been waiting for. Your coworkers make more than you? Your boss is unreasonable and doesn't appreciate you? Your paychecks aren't making ends meet? Your stagnant career is going nowhere fast? It's easier than you think to get paid like an expert. If Alan Corey can do it, so can you!